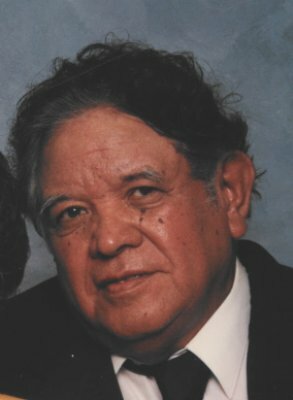 Jose “Joe” R. Flores, 91, of Fremont, OH passed away surrounded by his loving family on Thursday, April 4, 2019 at Elmwood Assisted Living in Fremont. He was born February 16, 1928 in Asherton, TX to Guadalupe Sr. and Ambrosia (Rodrigues) Flores. Jose proudly served in the U.S. Army during WWII and was awarded the WWII Victory Medal and the Army of Occupation Medal (Japan). He married Guadalupe “Lupe” A. Perales on June 1, 1949 in Laredo, TX and she preceded him in death on May 28, 2013. Joe worked as a press operator at Whirlpool Corporation where he retired after forty-two years of service. He was a member of St. Joseph Catholic Church, a Life member of the VFW and American Legion both in Fremont, OH. Joe enjoyed walking at Spiegel Grove, music, dancing and playing guitar. He also enjoyed spending time with his family especially attending his grandchildren’s activities. He was an avid sports fan, especially the Cleveland Indians and Browns. Jose is survived by his children, Yolanda (Thomas) Miller, Edna (Jim) Scherf and Thelma Stanley, all of Fremont, OH, Jose R. (Laura) Flores, Jr., Derby, KS, Fernando Flores, Bedford, OH, Victor (Elisa) Flores, Clyde, OH and René Flores, Fremont, OH; eighteen grandchildren, seventeen great-grandchildren and three great-great-grandchildren. He was preceded in death by his parents; wife, Guadalupe “Lupe” A. Flores; son-in-law, Larry J. Stanley; siblings, Eva Lozano, Robert Flores and Guadalupe Flores, Jr. and grandson, Daniel Flores. Mass of Christian Burial: Wednesday, April 10, 2019, 10:00 am, at St. Joseph Catholic Church, 709 Croghan St, Fremont, OH. Memorials: Hospice of ProMedica Hospice, St. Joseph Catholic Church or Elmwood Assisted Living of Fremont. Jose was a wonderful man and I’m so glad I had the chance to know him! He loved his family and had such pride for his country and service in the Army! He will be missed by all who knew him! Nando, your dad was a good man and friend. His friendship meant a lot to me. I will miss the trips we took to go watch the Indians and mud hens play. My sympathy to you and family! You have my deepest sympathy on the loss of your father. May you find peace is knowing that he is in heaven with your mother reunited in the love they shared here on earth. May time heal your loss and ease your pain. You are all in my thoughts and prayers. Prayers for you Austin and your family. Losing someone is never, ever easy. May you all find Peace, Faith, and Strength at this time. Always remember, when someone is so much a part of your life/lives, they never, ever really leave us; they’re with us in every moment, forever. Bless you & your family. We love you Tio Joe, you leave in our hearts all the memories we shared while we were all visiting up there in Ohio. God asked for a Angel and he chose you!! !Y You will be greatly missed!! We Love you Always all the way from Texas. Dear Thelma and family, so sorry to hear of your father’s passing. Many prayers send to all of you. Brandon, Austin, Alexis, Aiden, you were blessed to have your grandpa in your life, he Loved you all and he will forever be a part of your lives with all your memories, knowing he will be reunited with your grandma will bring you comfort, they both will be watching over you now ,smiling down on you.R.I.H Jose..
Prayers/thoughts to all the family, with sincere sympathy!! Sending my love and condolences from Florida. Know that you are all in my prayers. May God grant you comfort and healing now and receive Jose into his heavenly home. Sending healing prayers and comforting hugs. Celebrating the life of a good man and mourning his passing with you. God bless the entire Flores Family.